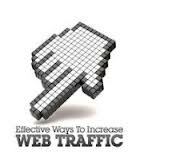 Yes there are some quick ways to get more traffic to your blog/website I am not talking about using any website to get web hits or anything like this I am talking about very genuine ways to get more traffic you your blog for free. 1. Make a face-book page as soon as you make the blog. This will help in gaining more exposer to a great no. of audience. 4.Share you Blog post url (not blog url) to the different social Networking sites this will help you gain more visitors. 5. Write always original content to your blog so the visitors visit back to your site for more good reading. (Read Writing Original Content).